After its first makeover in nearly 60 years, the University of Wyoming’s Geological Museum is ready to reopen to the public. While much of the work done over the past eight months -- modernizing of the mechanical, electrical, lighting and fire protection systems -- won’t be obvious to most visitors, they’ll definitely see improvements in the venerable museum’s layout and presentation. The museum opens its doors Saturday, Jan. 12, for the first time since closing in May, with resumption of its regular hours -- Saturday and Sunday from 10 a.m. to 3 p.m., and Tuesday through Friday from 10 a.m. to 4 p.m. Admission is free. A grand reopening ceremony, including guided tours, is planned from 3:30-5 p.m. Thursday, Jan. 17. UW President Tom Buchanan, the UW Board of Trustees and other university officials will be present. The Geological Museum project was funded, in part, through proceeds of an endowment of about $570,000 established by retired UW professor Brainerd “Nip” Mears and his wife, Anne, which was doubled to $1.14 million by state matching funds. Their contribution is a tribute to Mears’ mentor, Samuel H. “Doc” Knight, the notable geologist, professor and early curator of the museum. A patio bench will be unveiled in honor of Brainerd and Anne Mears. The roots of the Geological Museum reach back to 1887, the year UW opened. It started as a small natural history museum that consisted of the personal collection of early faculty member J.D. Conley. Eventually, the collection outgrew its home in the Hall of Language (now Old Main), and most of it found a new one in a wing of the Mechanical Building. When the Hall of Science was completed in 1902, the museum moved there. It stayed there until 1956, when the current structure was built on the east wing of what is now the S.H. Knight Geology Building, named for the man who was largely responsible for the museum’s layout and look. For years, a visit to the Geological Museum has been a step back into time -- in more ways than one. The interior has been largely unchanged over the past five decades -- even some of the exhibits hadn’t been altered since 1956. The $1 million renovation project has retained the museum’s historic charm while addressing the necessary infrastructure upgrades. Most noticeable are increased space and reorganization of the exhibits. “It still feels like an old museum, but it’s more expansive, open and polished,” says Mark Clementz, the museum's acting director. The remodeling is the first phase of a project aimed at making the museum a focal point for student and faculty research, while giving the public an appreciation of Wyoming’s geologic history and mineral resources. 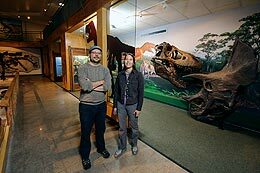 Museum supporters are particularly proud of a new display focusing on the Cretaceous period, which features a new mural that shows what Wyoming looked like in the Late Cretaceous -- along with casts of fossilized skulls of a Tyrannosaurus Rex and a Triceratops. The exhibit, crafted by designer Terry Chase of Chase Studios Inc., represents the type of display museum supporters hope to develop throughout the facility. The center island of the museum will continue to feature “Big Al,” the Allosaurus, and an Apatosaurus mounted by Knight, in a display focusing on the Jurassic period. A cast of a Stegosaurus, discovered near Medicine Bow, was moved from its former location upstairs to a prominent spot on the downstairs wall. Meanwhile, the museum’s collection of fluorescent minerals has a new, impressive home in an exhibit area that focuses on minerals. Part of the renovation project also includes a new fossil preparation lab, a spot for traveling exhibits and an exit to a new patio space where the bench -- in honor of Nip and Anne Mears -- will stand. The bench will be next to the iconic copper Tyrannosaurus Rex (crafted by Knight) that guards the museum entrance. Upstairs display space will have areas devoted to faculty and student research, as well as displays that focus on Wyoming’s marine fossils. Marshall Contracting of Laramie was the general contractor for the renovation. Museum supporters emphasize that more private support is needed, particularly for upgraded exhibits in the newly remodeled display spaces. “We’re excited about the renovations, but it’s just a start toward helping the museum reach its full potential,” says Art Snoke, professor and former head of the Department of Geology and Geophysics, who led a task force charged with reinventing the museum. For more information, go online to http://www.uwyo.edu/geomuseum/, email geolmus@uwyo.edu, or call (307) 766-2646.